The ethmoid bone (/ˈɛθmɔɪd/; from Greek ethmos, "sieve") is an unpaired bone in the skull that separates the nasal cavity from the brain. It is located at the roof of the nose, between the two orbits. The cubical bone is lightweight due to a spongy construction. The ethmoid bone is one of the bones that make up the orbit of the eye. The ethmoid bone is an anterior cranial bone located between the eyes. It contributes to the medial wall of the orbit, the nasal cavity, and the nasal septum. The ethmoid has three parts: cribriform plate, ethmoidal labyrinth, and perpendicular plate. The cribriform plate forms the roof of the nasal cavity and also contributes to formation of the anterior cranial fossa, the ethmoidal labyrinth consists of a large mass on either side of the perpendicular plate, and the perpendicular plate forms the superior two-thirds of the nasal septum. Between the orbital plate and the nasal conchae are the ethmoidal sinuses or ethmoidal air cells, which are a variable number of small cavities in the lateral mass of the ethmoid. two bones of the neurocranium—the frontal, and the sphenoid (at the sphenoidal body and at the sphenoidal conchae). eleven bones of the viscerocranium—, two nasal bones, two maxillae, two lacrimals, two palatines, two inferior nasal conchae, and the vomer. The ethmoid is ossified in the cartilage of the nasal capsule by three centers: one for the perpendicular plate, and one for each labyrinth. The labyrinths are first developed, ossific granules making their appearance in the region of the lamina papyracea between the fourth and fifth months of fetal life, and extending into the conchæ. At birth, the bone consists of the two labyrinths, which are small and ill-developed. During the first year after birth, the perpendicular plate and crista galli begin to ossify from a single center, and are joined to the labyrinths about the beginning of the second year. The cribriform plate is ossified partly from the perpendicular plate and partly from the labyrinths. The development of the ethmoidal cells begins during fetal life. Some birds and other migratory animals have deposits of biological magnetite in their ethmoid bones which allow them to sense the direction of the Earth's magnetic field. Humans have a similar magnetite deposit, but it is believed to be vestigial. Fracture of the lamina papyracea, the lateral plate of the ethmoid labyrinth bone, permits communication between the nasal cavity and the orbit on the same side of the body through the inferomedial orbital wall, resulting in orbital emphysema. Increased pressure within the nasal cavity, as seen during sneezing, for example, leads to temporary exophthalmos. The porous fragile nature of the ethmoid bone makes it particularly susceptible to fractures. The ethmoid is usually fractured from an upward force to the nose. This could occur by hitting the dashboard in a car crash or landing on the ground after a fall. The ethmoid fracture can produce bone fragments that penetrate the cribriform plate. This trauma can lead to a leak of cerebrospinal fluid into the nasal cavity. These openings let opportunistic bacteria in the nasal cavity enter the sterile environment of the central nervous system (CNS). The CNS is usually protected by the blood-brain barrier, but holes in the cribriform plate let bacteria get through the barrier. The blood-brain barrier makes it extremely difficult to treat such infections, because only certain drugs can cross into the CNS. An ethmoid fracture can also sever the olfactory nerve. This injury results in anosmia (loss of smell). A reduction in the ability to taste is also a side effect because it is based so heavily on smell. This injury is not fatal, but can be dangerous, as when a person fails to smell smoke, gas, or spoiled food. In fact, people with anosmia were more than four times as likely to die in five years compared to those with a healthy sense of smell. Ethmoid bone (view from behind). Ethmoid bone from the right side. ^ OED 2nd edition, 1989 as /ˈεθmɔɪd/. ^ Entry "ethmoid" in Merriam-Webster Online Dictionary. ^ a b c d Saladin, Kenneth S. (2015). Anatomy and Physiology: the Unity of Form and Function (7th ed.). New York: McGraw Hill. ISBN 978-0-07-340371-7. ^ "Ethmoid bone". www.anatomynext.com. Retrieved 1 March 2018. ^ Fehrenbach; Herring (2012). Illustrated Anatomy of the Head and Neck. Elsevier. p. 52. ^ Jacobs (2008). Human Anatomy. Elsevier. p. 210. ^ Baker, R. Robin; Mather, Janice G.; Kennaugh, John H. (1983). "Magnetic bones in human sinuses". Nature. 301 (5895): 78–80. doi:10.1038/301078a0. ^ Pinto, Jayant; Wroblewski, Kristen; Kern, David; Schumm, Phillip; McClintock, Martha. "Olfactory Dysfunction Predicts 5-Year Mortality in Older Adults". PLOS One. 9 (10): e107541. doi:10.1371/journal.pone.0107541. PMC 4182669. Saladin, Kenneth S. (2010). Anatomy and Physiology: the Unity of Form and Function (5th ed.). New York: McGraw Hill. ISBN 978-0-07-128341-0. Banks, Peter; Brown, Andrew E. (2000). 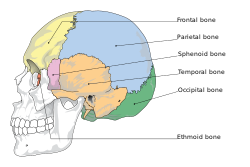 Fractures of the facial skeleton. Oxford: Wright. ISBN 0-7236-1034-7. Wikimedia Commons has media related to Ethmoid bones. "Anatomy diagram: 34256.000-1". Roche Lexicon - illustrated navigator. Elsevier. Archived from the original on 1 January 2014.